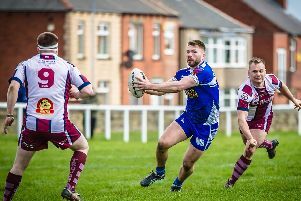 Teenager Danny Thompson was one of the stars as Featherstone Lions rediscovered their winning touch with a 26-6 success at home to Dewsbury Moor Maroons in Division One of the National Conference. The Lions had to keep their calm in the second half as a couple of Moor players seemed to lose the plot. But along with Thompson fellow teenagers Lewis Jackson, Conner Paver, Jake Wood and Jack Ellam did themselves and the club proud in spite of some cheap shots and intimidation. Paver and George Nuttall did some good covering early on as the visitors moved the ball about well. But after Scott Glassell and Joe Fox went close Ben Mawson went over with his first touch of the ball and Ian Jackson added the conversion. The baby faced Lewis Jackson then pulled off two try saving tackles inside 30 seconds. First he pulled up in the middle of the park before seconds later his fine cover tackle knocked the Moor winger into touch. 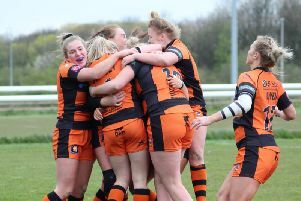 Fox put in a fine big hit and Thompson went close to scoring, but on the stroke of half-time fast handling saw the Dewsbury side score a good try wide out. The conversion was added to level the score at 6-6. With Evan Morris again doing lots of donkey work up the middle and Nuttall and Scott Glassell probing away the Lions hit the front again in the second half as a fine Tom Wandlass ball led to Gaz Williamson knocking aside two men to go over the whitewash. Jackson again tagged on the extras. Paver and Morris kept up the momentum and an Ian Jackson chip saw a Moor defender taken over his dead ball line. After Thompson made a fine midfield run some crisp handling led to Gaz Gale going over wide out to make it 16-6. Featherstone went down a man for 10 minutes with a player in the sin-bin, but that did not stop them attacking with Lewis Jackson going on a run and only held close to the Moor line. Jake Wood and Rich Frankland did some hard yards for the Lions before swift hands led to Wandless giving a gem of a ball to Ellam who finished off well. With Nuttall, Paver and Wood tackling well, Lions kept out their opponents despite coming up against some niggly tactics. Then after Mawson went close Scott Glassell shot over for his usual try with Ian Jackson adding the extras to make it 26-6. In the dying minutes Lewis Jackson again made a fine cover tackle to snuff out a Moor threat and ensure the 20-point lead would be maintained until the end. It was a badly needed win for the Lions to get them back on track and move them up to eighth, but they know they are not yet playing the rugby they know they can play, leaving the players and coaching staff frustrated. Lions have no game this weekend and are back in action at Stanningley on Saturday week, 2.30pm kick-off.